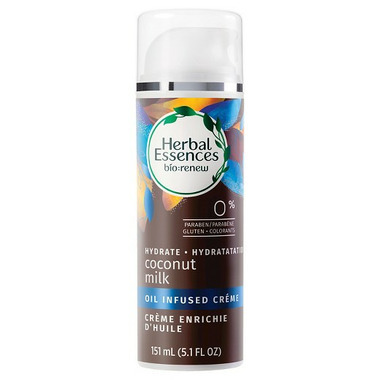 Herbal Essences Coconut Milk Oil Infused Crème is crafted with bio:renew, a signature blend of essential antioxidants, aloe and sea kelp, designed to help purify and protect against impurities. Your hair will truly get softer and more free·flowing because the bio:renew formula continues to work with each use. Plus, you’ll notice your hair shining brighter and more hydrated. From the first pop of the cap, our Coconut Milk Conditioner will take you on a soft and fresh multi·layered scent experience. Immerse yourself in the scent of vibrant coconut followed by a fresh bouquet of white florals and deep vanilla. Simply spread evenly through damp hair and style. It’s that easy. For even more stunning hair, use alongside Coconut Milk Shampoo and Conditioner with bio:renew.